Syro-Malankara Mass by Msgr. Thomas Kurisummoottil Vicar General of Malankara Forane in the Archeparchy of Kottayam. Reception to Cardinal Telesphore P. Toppo, the Archbishop of Ranchi along with Archbishop Mar Mathew Moolakatt and Bishop Mar Jacob Angadiath at 7:00 P.M.
First Solemn Feast of B.V. Mary at St. Mary’s Church. Archbishop Mar Mathew Moolakkatt, Bishop Mar Jacob Angadiath, and Bishop Mar George Palliparambil were celebrants. Archbishop of Agra Most Rev. Dr. Albert D’Souza inaugurated the Kala Sandhya. Feast sponsors: Saju Kannampally, Saji Poothruakkyil, Sunil Vettathukandathil, Jose Aikkaraparambil, Anil Mattathikunnel, Maneesh Kaimoolayi, Mathewkutty Poozhikunnel, Sini Nedumthuruthil, John Pattapathiyil, Jaya Kulangara, Della Nediyakalayil, and Saly Kizhakkekkuttu. Agape Store inauguration by Archbishop of Agra Most Rev. Dr. Albert D’Souza and blessing by Bishop of Miao Most Rev. Dr. George Palliparambil. First Holy Communion of 10 students and Chrismation of 11 students in the parish church officiated by Fr. Abraham Mutholath. This is the first such event in this church. Retreat for adults and youth at Morton Grove. Preachers: Fr. Tom Kunnumpuram, Bro. Sunny Stephen, Aravnidaksha Menon. First Pre-marriage course at St. Mary’s Church. Started Legion of Mary at the church. Strategic Planning by leaders of both Sacred Heart and St. Mary’s churches at Holiday Inn in Skokie inaugurated by Bishop Mar Jacob Angadiath. 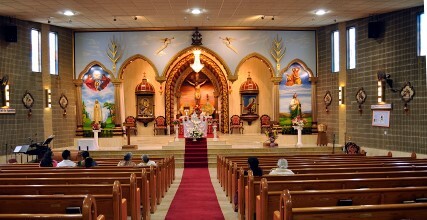 Holy Mass by Mar Joseph Pandarasseril at Morton Grove at 9:00 A.M. as part of Centenary Celebrations of the Archdiocese of Kottayam. Feast Celebration of St. Stephen at 10:00 A.M. sponsored by parishioners from Uzhavoor Forane. Main Celebrant: Bishop Mar Jacob Angadiath. Tenth Anniversary Inauguration of the St. Thomas Syro-Malabar Diocese at the parish level by Bishop Mar Jacob Angadiath in the hall after Holy Mass. Meeting of First Communion Students and their parents with Bishop Mar Jacob Angadiath after the inauguration meeting. Syro-Malankara Holy Mass by Bishop Thomas Mar Eusebius on the occasion of 68th anniversary of Late Bishop Dioscorose Mar Ottathaikal. Blessing of Adoration Chapel in the sacristy of St. Mary’s Church by Fr. Abraham Mutholath. The chapel is sponsored by prayer group of St. Mary’s Church. Seventh Religious Education Festival of Sacred Heart and St. Mary’s parishes at Maine East High School, Park Ridge. Theme: “God’s Call and Selection of Humanity.” Inauguration by Vicar General Msgr. George Madathilparambil. Lenten Retreat by Nellikkutty Sion Retreat Center. Team: Fr. Thomas Kochukarott, Sr. Tessin, Sr. Margaret. Passion Play at the church by Wieczernik Theatrical Group of St. Hyacinth Basilica Parish. Fundraising Program “Kannasum Kadalasum Pinne Njangalum” at Copernicus Theater. First Holy Communion of 48 students and Chrismation of 44 students in the parish church officiated by Fr. Abraham Mutholath. Centenary Celebrations of Kottayam Diocese by Knanaya Region at Mary’s Knanaya Catholic Church Chicago. Holy Mass by Archbishop Mar Mathew Moolakkatt with Knanaya Region Priests. Angels’ Meet, honoring graduates from high school and eighth grade, and honoring couples who have 10th 25th and 50th wedding anniversaries. First Anniversary Celebrations of the parish. Blessing of the Shrine of Blessed Mother Mary at the entrance of the church by Fr. Abraham Mutholath. Kulangara family sponsored the shrine. Presentation by Niles Maryhill Cemetery staff on the availability and purchase options of 1,400 graves for St. Mary’s Knanaya Catholic Parish. Started purchase of plots for Knanaya Catholic Cemetery at Maryhill Cemetery in Niles. Main feast of the parish. Bishop Mar Jacob Angadiath was the main celebrant on Friday. Tour to Wisconsin from St. Mary’s Church. Vocation Camp at the church. Apple Picking tour by men’s ministry of St. Mary’s Church. Starting of Two year Theology Course. The classes will be once a month. Reception to Major Archbishop Mar George Alancherry by both churches at St. Mary’s Knanaya Catholic Church and blessing of the remodeled front elevation of St. Mary’s Church. Major Archbishop and Bishop Mar Jacob Angadiath offered Holy Mass after the blessing. Knanaya Region Priests meeting at St. Mary’s Church, Chicago. Beginning of Youth Theology Course for High School students in 12 sessions within nine months. First Night Vigil at St. Mary’s by Fr. Saji Pinarkayil. It will continue every second Friday of the month. Bible Quiz by prayer group at St. Mary’s for Sacred Heart and St. Mary’s parishioners. Family Day Celebration organized by Family Commission and ministries of the parish. Youth Ministry Retreat at Bishop Lane Retreat Center, Rockford. 120 youth from Sacred Heart and St. Mary’s Knanaya Catholic parishes participated in the retreat. New parish executive took charge. Syro-Malankara Holy Mass by Bishop Thomas Mar Eusebius at 6:30 P.M. at St. Mary’s in remembrance of Most Rev. Thomas Mar Dioscoros Ottathaickal. Bishop Angadiath met with Holy Communion students at St. Mary’s followed by English Mass for Religious Education Students at 11:45 A.M.
Archbishop Mar Mathew Moolakkatt made clarification on Knanaya membership issue at a public meeting held at St. Mary’s Knanaya Catholic Church, Chicago. Passion Play at our church by prayer theatrical group, “Wieczernik” from St. Hyacinth Basilica. Annual Lenten Retreat by Fr. Joseph Uppani, Chittoor Retreat Center and Stephen Almathadathil. Eighth Religious Education festival by both churches at Maine East High School Auditorium. Bishop Mar Jacob Angadiath was the chief guest. Theme: Evangelization. Fr. Abraham Mutholath started “Birthday Charity” at Mary’ Knanaya Catholic Church, Chicago by blessing those who have birthdays in each month. The offering given through Agape Movement are given for education aid in the Diocese of Kohima. Combined meeting of parish executives of Sacred Heart and St. Mary’s churches at parish rectory at Elmhurst. Starting of Youth Night Vigil on every third Friday of the month. First Holy Communion of 39 students and Chrismation of 23 students in the parish church officiated by Fr. Abraham Mutholath. Stated Malayalam Class for grades 1 to 4. His Excellency Dr. James Thoppil, Bishop of Kohima, Nagaland offered Holy Mass and shared his missionary experience with parishioners. Pilgrimage to Marian Centers in Europe by Sacred Heart and St. Mary’s Knanaya Parishes led by Fr. Abraham Mutholath and Fr. Saji Pinarkayil. Second anniversary celebrations of St. Mary’s Church. Blessing of Knanaya Catholic Cemetery Shrine at Maryhill Cemetery, Niles on Sunday, July 22nd at 11:45 A.M. by Vicar General Fr. Abraham Mutholath. Fr. Siju Mudakkodil took charge as associate pastor of Sacred Heart and St. Mary’s parishes. Second anniversary celebration of the parish along with Koodarayogam annivervsary. Main feast of St. Mary’s Church. Bishop Mar Jacob Angadiath was the main celebrant on August 10th. Bishop also blessed the new flag post installed in front of the church sponsored by the sponsors of the feast: Francis Kizhakkekuttu, Jose Pinarkyil, Raju Nediyakalayil, Jaibu Kulangara, James Thirunelliparambil, and Shaji Edat. Summer camp at St. Mary’s Church for Juniors. Tour to Starved Rocks, Utica, IL by Sacred Heart and St. Mary’s parishes. Knanaya Region Priests’ Council at St. Mary’s Church, Chicago at 2:00 P.M.
Knanaya Region Pastoral Council (priests and lay representatives from parishes and missions) at St. Mary’s church, Chicago from 6:30 P.M. to Saturday noon. Bishop Mar Jacob Angadiath officiated the Holy Mass at the conclusion of the 10-day rosary devotion. One Day Retreat by Fr. George Panackal V.C. at St. Mary’s. Inauguration of Year of Faith in the parish by Bishop Mar Jacob Angadiath. Pilgrimage to Guadallupe, Mexico from St. Mary’s Church organized by the Pilgrimage Committee of the parish. 46 people participated in the pilgrimage. End of Holy Rosary Year and beginning of Bible Reading Year. Episcopal Ordination of Mar Joy Alappatt at Mar Thoma Sleeha Cathedral.